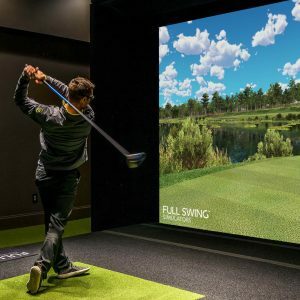 As one of the premier, year round public golf facilities in Northeast Pennsylvania, Pine Hills is proud to introduce two new e60 Full Swing Multisport Simulators. Both simulators are loaded with 42 top courses from around the world to choose from. Our Full Swing Golf simulators also come equipped with five other sports including baseball, hockey, soccer, lacrosse and football. New ball-and-club head sensor systems from Full Swing Golf now give you incredibly accurate spin, trajectory, and distance measurements that allow precisely replicated real ball flight. Only Full Swing combines two distinct ball tracking technologies to create the most accurate ball tracking data in the industry today. Reservations are highly recommended but not required. Please call 570-562-0138 to make a reservation or for further questions click our FAQs page. Seniors/Ladies (weekdays before 4 pm) $32.00/hr.